Z-Studios announces the launch of our newly re-designed website! This new website coincides with the addition of our new Mitsubishi Waterjet Cutter to the lineup of precision metal fabrication services that we provide. The Mitsubishi Waterjet Cutter allows us to cut with an unprecedented precision, through any material, any thickness, without affecting the integrity of the material. It is faster and more efficient, enabling quicker turnaround time for your project. Respecting deadlines is one of our top priorities. 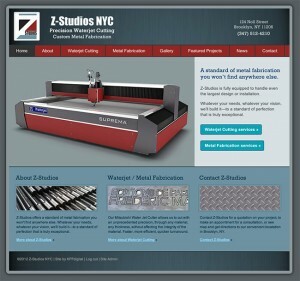 We invite you to take a look around this new website to see information about metal fabrication, waterjet cutting, images, case studies of our work, and to learn more about Z-Studios.